A Buddha bowl is a bowl packed full of food resembling a belly appearance like a Buddha statue. 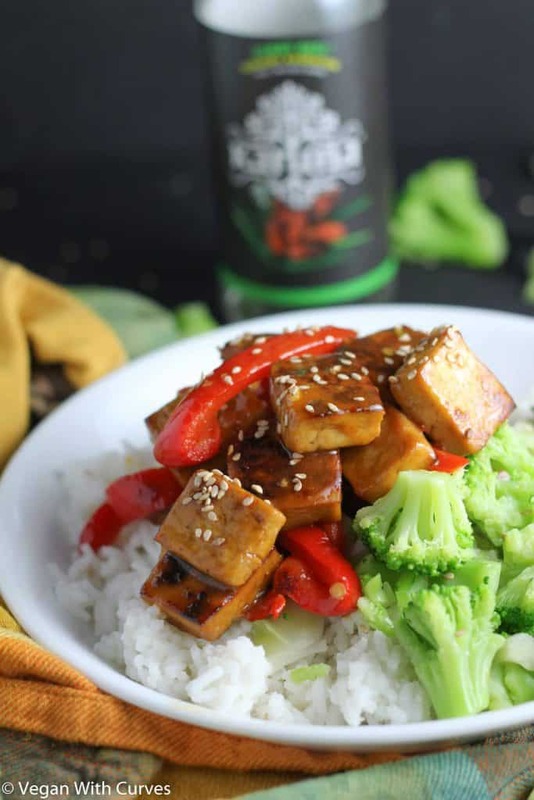 This tofu Buddha bowl contains glazed tofu, white rice, and broccoli. A healthy filling meal after an intense yoga or strength training session. I am one of those stereo typical vegans that actually like tofu. Unfortunately not everyone shares my love for it. Outside of all the conversational of soy products (a topic for another post), some people think it’s nasty and plain tasting. But when prepare properly the flavor and texture are delicious! Today I will show you how to get the most out of this versatile ingredient. For this recipe I partnered with Karuna to make my marinate and glaze sauce. Karuna Sunny Date drink is very hydrating because it contains no refined sugar (refined sugar dehydrates you). It is great to drink during or after your workout. This natural bottled drink is sweetened with Chinese dates (aka Jujube). Jujube are high and fiber and rich in vitamins like iron and phosphorous (phosphorus is good for bones) and vitamin C (more than citrus fruit). 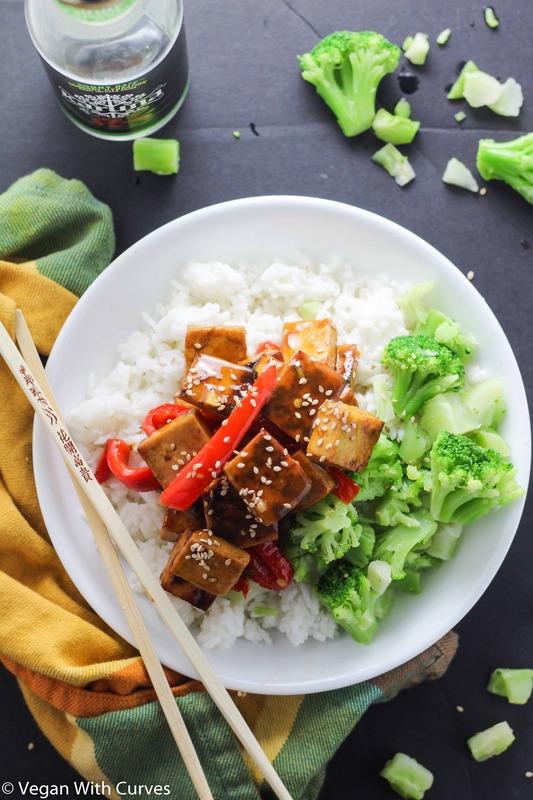 Tofu is a high source of plant based protein containing all 9 essential aminos acids. It is a unique bean because it is high in protein but low in carbohydrates so it can be great as a post workout meal. Tofu has 10 grams of protein per half a cup. White rice instead of brown rice? Well yes. White rice is not something I recommend eating all the time BUT it is the preferred carbohydrate to consume with a meal AFTER an intense workout (preferably a leg day where you are trying to build mass.) Why? Because brown rice is a complex carbohydrate and takes longer to digest. White rice digests much faster. So organic white rice has it’s purpose. It has 45 carbs per 1 cup. When eating raw or lightly stem, broccoli is a good source of vitamin C. Broccoli is also a good source of vitamin K which helps calcium absorption for strong bones/. Now what’s going to make your tofu taste good is how dry it is and how you marinate it. First you are going to press all the water out of your tofu by cutting it properly and placing blocks between layered paper towels. Set something heavy on top like books or weights. DO NOT SKIP THIS STEP! The dryer the tofu, the better the texture and the more it will hold flavor from the marinate. 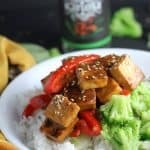 You can also use a tofu presser or buy pre pressed tofu from Trader Joes to save time. Second, marinate your tofu for about 30 minutes (or longer if you have time. Sometimes I let it sit overnight). Throwing sauce on top of your tofu will do nothing. You have to marinate your tofu so that it soaks up all the flavoring. DO NOT add oil to your marinate. It will coat your tofu not allowing the flavors to soak in. Third, bake your tofu. This will lock in those flavors and help give it a meaty like texture. Once baked to you desired texture set aside to cool. Last add the stir fry vegetables of your choice and tofu to a skillet. Pour glaze over mixture until it starts to thicken. Top this and your steam brocoli on top of your white rice to make a delicious Buddha bowl! If this is your first time having a Buddha bowl, after this recipe it will become a staple. Enjoy! DID YOU MAKE THIS RECIPE? Tell me how it turned out for you! Was it a hit or miss? Do you normally eat Buddha bowls? If so what is your favorite combination? Tell me about it. Leave a comment below, rate it, and PIN IT! Also tag a photo @_VeganWithCurves and hashtag #VeganWithCurves on Instagram so I can see it! Have white rice and steam broccoli prepared. You can use fresh or frozen broccoli already in steam bags. You can buy white rice already cooked. Begin by drying your tofu. Drain, remove from package and slice in half vertically making the block thinner. Take sliced pieces and cut them in half so now you have 4 blocks. 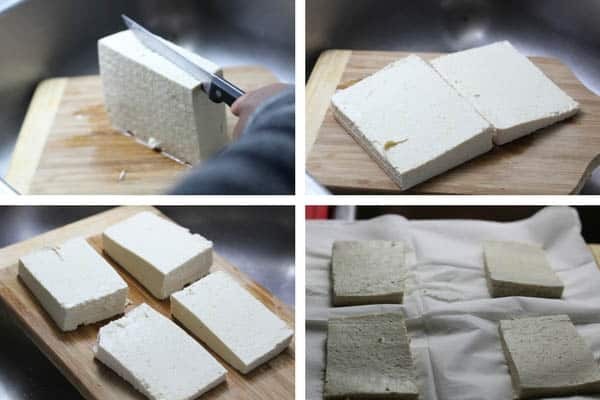 Place the 4 tofu blocks between two thick towels folded into the shape of the tofu. Then place something heavy on top like a heavy skillet with weights or my favorite; old college textbooks. Press for minimum total time of one hour. After the first 30 minutes, change the paper towels (the will be soaked) and continue pressing for the remainder of the 30 minutes. (see photos above). To save time you can buy tofu that has been pre pressed (Trader Joes sells organic sprouted tofu pre pressed) or a tofu presser. While tofu is pressing, prepare marinate sauce by combining Karuna’s Sunny Drink, soy sauce crushed red pepper, ground ginger, garlic powder, and onion powder. Taste and adjust seasonings as desired. DO NOT add oils to your marinate. Oils will coat the tofu. You actually want the flavors of the marinate to soak into the tofu. Once you have pressed out the water, cut your tofu into cubes (see photo), add to a large bowl and pour your marinade; toss. Let let it sit covered in the fridge for at least 30 mins. Longer if you have the time. Preheat oven to 375 degrees F. Arrange tofu cubes on a lightly greased pan (this helps prevent sticking and adds a crisp outer texture). For a more softer tender texture (which I highly prefer) bake for a total of 20 minutes. For a tougher tofu bake for 25 to 30 minutes. Flip once halfway to ensure even cooking. Grab a large skillet and place over medium-high heat. Add sesame oil and veggies to pan. Cook for 6-7 minutes tossing and stirring until vegetables have softened. Add your stir fry sauce and stir. Once it starts to bubble and become thick, add tofu and coat. Cook for an additional 1-3 minutes. Remove from heat. Divide the rice into bowls, top with tofu, and broccoli. Best when eaten fresh, but it will keep in the refrigerator 2 or 3 days. The glaze becomes less “glaze like” once reheated. But thanks to the marinate you still get that good flavor. Does not freeze well. 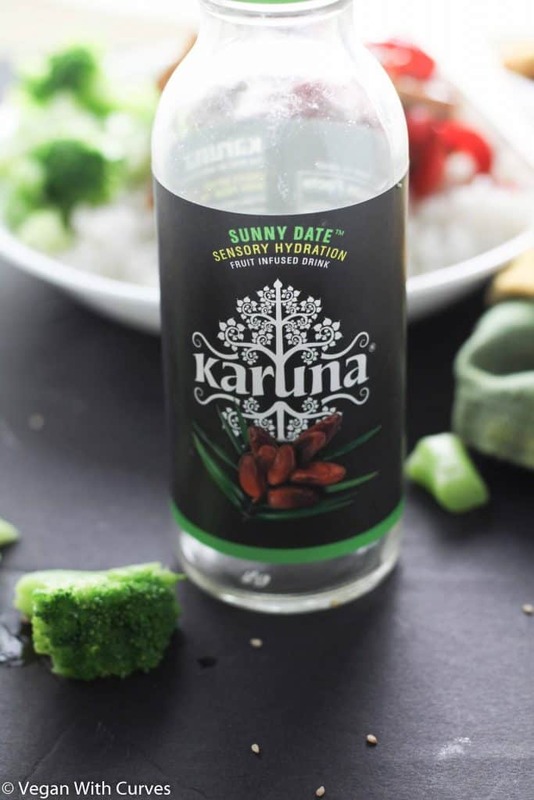 Karuna’s natural bottled drinks are available in the Chicago and St. Louis area and will be expanding! If you currently do not have access to these drinks use plain use pineapple juice instead. Note pineapple juice is highly sweeten so it is suggested to omit sugar for the glaze. As always adjust to your taste buds. Braggs Liquid Aminos or coconut aminos can be used in place of soy sauce. To make this soy free try with setain, chickpeas AND mushrooms (chickpeas are protein friendly), or your favorite soy free meat substitute. To make this low carb and/or decrease calories, use cauliflower rice. (Curve builders if using cauliflower rice, include some healthy fat like nuts or seeds.) To make this grain free but carb friendly substitute with sweet potatoes.